If you find yourself sitting at your desk dreaming about living in your space dome in the future then you’ll think these little desktop terrariums are just out of this world! Although these funky little space men planters look like something from the planet Mars they’re actually from the Italian commune of Nove. 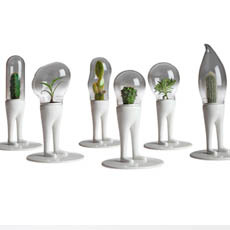 No two Domsai Terrariums are exactly the same since each is hand cast and mouth blown. Plants not included so you’ll have to collect your own specimens.